HEALING AND MARTIAL ARTS BLOG » Blog Archive » WILL TAI-CHI SURVIVE? Tai-chi teachers who actually expect their students to learn Tai-chi fear that they will lose students. Tai-chi is a very exacting practice and requires awareness of each muscle and joint of the body, restoring full function. While many people would love to learn Tai-chi, few are ready to do the work. So the teacher must decide how much he or she asks of the students. The less he asks, the more students he has. The more he asks, the higher quality of students he has. Sometimes the decision rests on how many bills he has to pay each month, unless he has a “real job”. 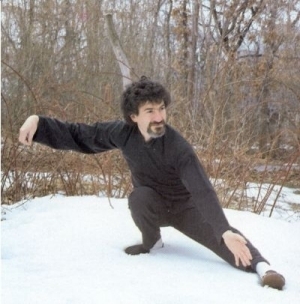 To the degree that the decision is based just on paying the bills, the students get a “make-believe” version of Tai-chi and that version is passed down, as that teacher’s students themselves become teachers, believing that they are really practicing Tai-chi. That teacher may defend himself by saying, “If I didn’t dilute Tai-chi, these students wouldn’t come to class. At least they are moving. That has to help them a little”. These are the issues in the back of each teacher’s mind. I bring this issue up now because I have been hearing the same issue raised in the field of Pilates exercise. Some Pilates teachers say that they don’t mind if a teacher changes the training as long as they don’t call it Pilates. My choice is to require that my students learn Tai-chi. They sometimes complain that I keep teaching new principles and they can’t keep up with the pace of learning. Yet I am teaching the same thing all the time even though I may explain it differently. They may ask, “Why didn’t you ever say that before” even though I say it all the time. When you are presenting the deeper aspects of Tai-chi training, the body of the student has to learn. The brain may feel that it is not “getting it”, but the brain doesn’t have to get it. The body learns and the student has to become comfortable with and learn to perceive that level of learning. Yet the brain always feels that if it hasn’t learned something then it hasn’t been learned. When you really teach Tai-chi you bring the student through a transformation in the learning process. The student learns about his body and attention (how they work), then learns from the body and attention and then body, attention and the world around him all become connected. Make-believe Tai-chi, of course, is just memorizing as many forms as you can and learning to say spiritual clichés. This may seem like a cynical attitude but the schools that emphasize this approach really irk sincere teachers. While the students of these schools certainly enjoy their classes, the downside is that the reputation of Tai-chi as transforming peoples’ lives just comes down to parroting phrases and movements. Is there a danger that Tai-chi will become a cartoon of itself? If this is happening to other disciplines as well, are we all simply slipping into cartoon lives? I have heard the argument that during most times in history, a few people really practiced each art and the rest practiced a shallower version and yet these arts survive. These times are no different from any other. I hope that is true. What do you think?